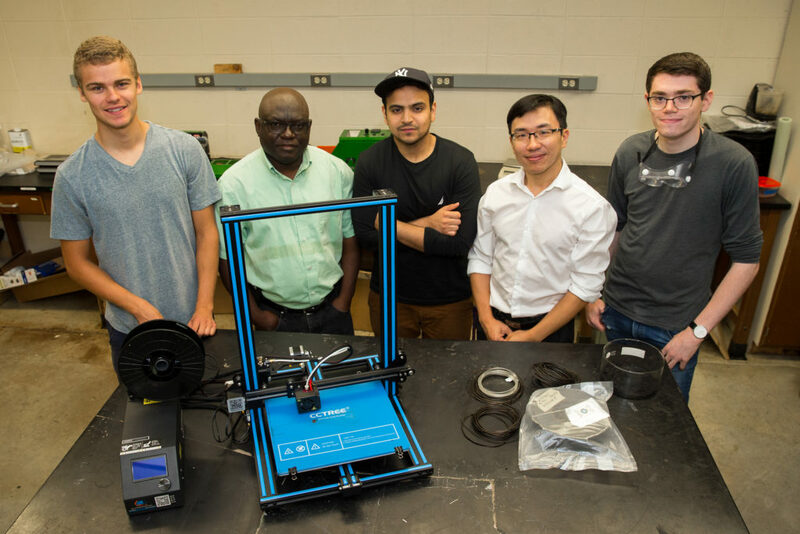 (from left) Kevin Vergenz, mechanical engineering student; Dr. John Obielodan, associate professor of mechanical engineering; Danyal Aqil, mechanical engineering student; Dr. Joseph Wu, associate professor of chemistry; and Jamison Wallace, chemistry student. Student researchers not pictured are Michael Carr, mechanical engineering student, and Zhiwei Yang, software engineering student. PLATTEVILLE, Wis. – Dr. John Obielodan, associate professor of mechanical engineering at the University of Wisconsin-Platteville, and Dr. Joseph Wu, associate professor of chemistry at UW-Platteville, are collaborating through two research grants that they received from the WiSys Technology Foundation and the UW System to develop a thermoplastic biocomposite for 3D printing. Together, along with undergraduate researchers, they are working this summer and beyond to use wood waste extractions to develop a low-cost biocomposite for 3D printing applications and create an eco-friendly substitute to petroleum-based printing products. On the chemistry side, Wu is focused on extracting raw materials from wood and other organic materials. The product from biological waste will be repurposed for 3D printing. It could have unique properties, and Wu believes this project will lessen the impact of petroleum-based products on the environment. “We are trying to make a biopolymer using wood waste and other bio-based materials,” Wu said. The project will enable the development of a laboratory-scale system for wood extraction. Obielodan has expertise in materials and novel structures development using additive manufacturing technologies, also known as 3D printing. He has been working with biomaterials in the 3D printing process for structures fabrication at UW-Platteville. Obielodan and Wu said they are excited about the opportunity to work on projects that could influence the 3D printing industry and help the environment. They believe there are many benefits to researching, including professional development for their students and themselves. Obielodan and Wu enjoy working with cross-disciplinary research projects and with the students in the summer and beyond. Obielodan believes these types of opportunities show students many aspects of research, including the challenges that they might face. Obielodan and Wu received an Applied Research Grant and support from the Prototype Development Fund through the UW System and the WiSys Technology Foundation. This program encourages faculty and staff to work toward economic development in Wisconsin.